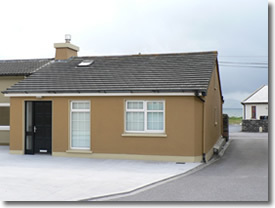 Eileen's Cottage is a traditional semi-detached cottage located near Castlegregory Village on the Dingle peninsula in West Kerry. one double room and a large room with two sets of bunk beds. 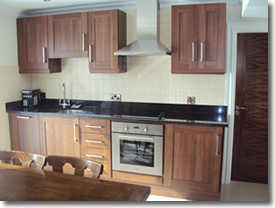 Eileen's Cottage has been renovated to a high standard and can accommodate six people. The open plan living room/kitchen is fully fitted out with all modern conveniences including electric cooker, washing machine, dishwasher and microwave. In the living room area there is a stove and colour television. The house is heated by oil fire central heating. The cottage has wonderful views of Brandon Bay and is located beside a lively local pub. The house is situated 14 miles along the Dingle Peninsula from Tralee which stretches for some 48km westward from Tralee town. The Dingle Peninsula has more interesting antiquities, historic sites and varied mountain scenery than any other part of Ireland. Fahamore is an ideal location for your holiday, whether it is peace and quite, walking to your hearts content, swimming or relaxing on the beach. 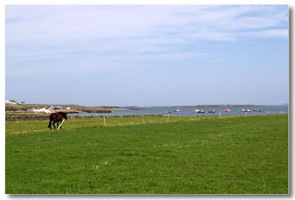 Pony trekking, fishing and boat trips to the Maharees islands are available for the more adventurous. There is a 9 hole golf course - certainly worth a visit for the golfers. 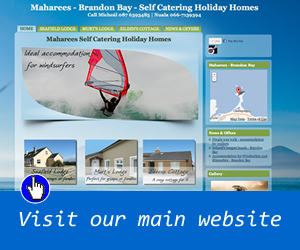 The famous Jamie Knox Windsurfing School is only a walk away. Scuba diving and deep sea diving is available at the nearby Dive Centre. End your day with a seafood platter or the best of steak at Spillane's Bar or a quite pint and singsong in our local pub The Green Room.